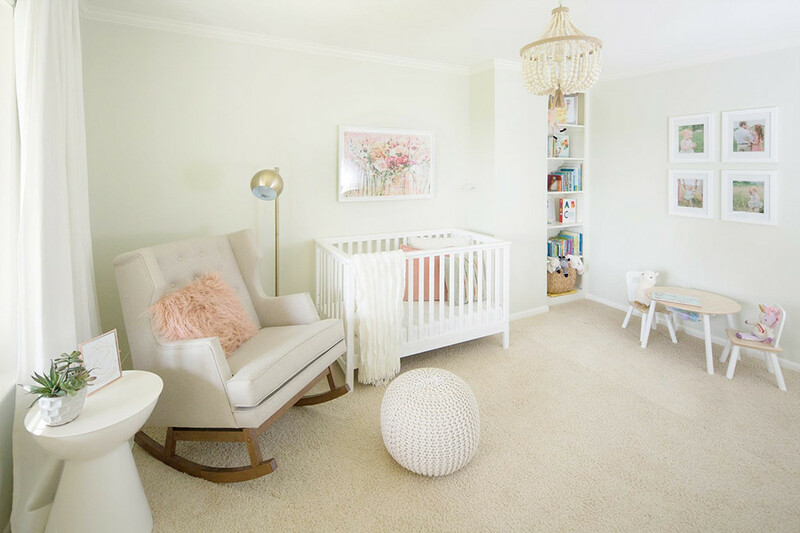 A neutral space with just enough darling accents to give it charm and personality is what Grace Squires was aiming for when she decorated her daughter Vivian’s nursery. Pale olive wall color allowed for a neutral color scheme with pops of pink. A neutral space with just enough darling accents to give it charm and personality is what Grace Squires was aiming for when she decorated her daughter Vivian’s nursery. With a knack for creativity and style and a degree in apparel from the University of Arkansas, Grace isn’t a interior design professional, but has an eye for decor and styling. 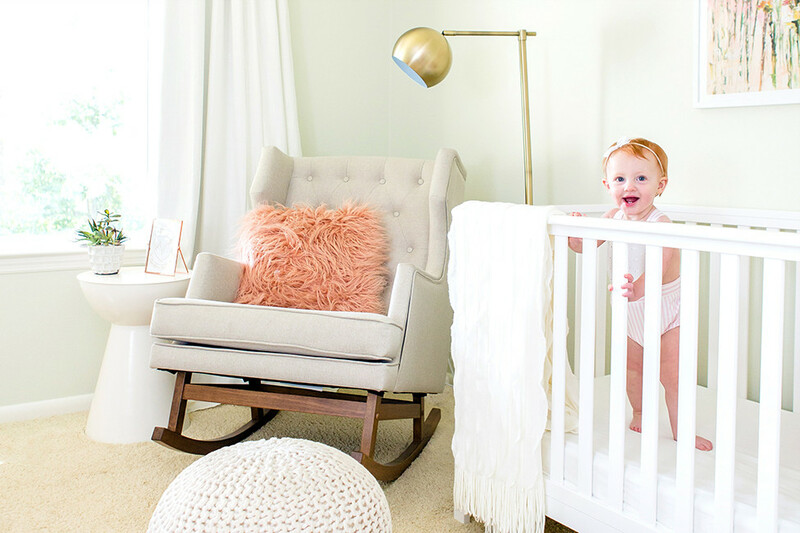 Her daughter, Vivian, modeled for our cover in her own nursery and Grace shared some advice for parents who are taking that first step into decorating spaces in their own home. Where did you get your inspiration for this room? I knew that I wanted to do something not super girly or gaudy. I wanted something light and airy that could kind of grow with her. I didn’t want to do a whole lot of pink or frilly. I really started looking on Pinterest and Instagram and certain bloggers I follow. I found a lot of little pieces like someone’s crib or how they did a little bookshelf nook. I got inspired by searching the web — it’s so accessible! What do you recommend for someone who isn’t design-minded as they start the process of decorating a space? If you know someone, don’t be afraid to reach out. I’ve had friends and family members reach out and I think pawning off ideas on friends and family members is always the best. If you know what you’re looking for and the kind of style you have in mind, Pinteresting and searching is my best advice. Know what you want so you always have a part of yourself in whatever room you’re looking to decorate. I have a few interior designer friends that I can get advice from or bounce ideas off. Small accents like plants and pictures can easily be swapped out for fresh decor. A tasseled light fixture adds unique character to the room. What are your most and least used items in the nursery? I loved having my changing table. I ended up buying a table off Wayfair and then at Target got a changing table to screw into the top and I really liked that. A rocker is essential. I definitely went for the more cute than comfy rocker and maybe going back I may have gone a little more comfy but it still works. What’s your favorite element of the room and why? I love the inset bookcase, which came with the house. That was super helpful. I used to have a bunch of swaddles in a basket on there and now I use it for her books. I also really love the functional crib and the painting over it. I went with simple because I didn’t want to do a lot of crazy. I wanted the accessories to stand out and for it to be more subtle. Simple can look fancy and elevated. A built-in bookshelf is Grace Squires' favorite element of the nursery.